Chase De Leo scored on the final shot of the shootout to give the San Diego Gulls a 6-5 victory over the Ontario Reign Saturday evening in Ontario, their first win of the 2018-19 American Hockey League season. 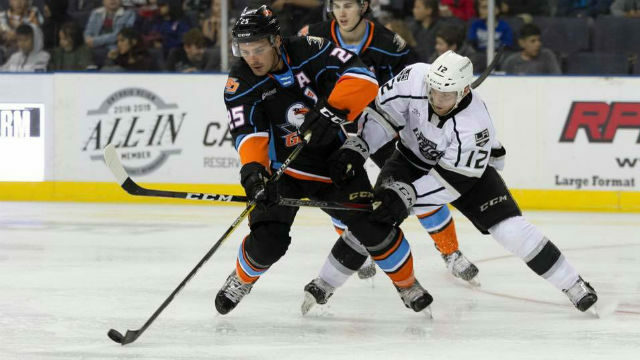 Gulls center Sam Carrick and Ontario forward Sheldon Rempal both scored in the first round of the shootout. Neither team scored in the second round. Reign defenseman Sean Walker failed to score to start the third and final round of the shootout. Defenseman Andy Welinski scored two second-period goals and assisted on Logan Shaw’s first-period power-play goal while left wing Giovanni Fiore scored in the first period and assisted on Welinski’s second-period power-play goal as the Gulls (1-2-0-0) became the final team in the seven-team Pacific Division to record a victory. Ontario (1-1-1-1) tied the score with 10 minutes, 24 seconds to play in regulation on Kurtis MacDermid’s goal. “I think it’s tough giving up a goal late like that, but we stuck with it and that’s something that we didn’t necessarily do last weekend so that’s an improvement,” Welinski said, referring to last Saturday’s season- opening 6-4 loss to the Tucson Roadrunners where the Gulls allowed the final four goals. Neither team scored in the five-minute overtime, which the Gulls led in shots, 2-1. Overtime in the AHL is played with three skaters per team, two fewer than normal. However, when a penalty is called, such as the tripping penalty to Gulls right wing Pontus Aberg 31 seconds into overtime, the other team gets an additional skater. The Reign tied the score, 3-3, 1:04 into the second period on left wing Mikey Eyssimont’s second goal of the season. The Gulls reclaimed the lead 50 seconds later when Welinski put in a rebound of a shot by Ben Thomson for his first goal of the season. The Gulls increased their lead to 5-3 with 44 seconds left in the second period on Welinski’s power-play goal before a crowd at Citizens Business Bank Arena announced at 8,795. Ontario cut the deficit to 5-4 39 seconds into the third period on Matt Moulson’s power-play goal when the Reign had a two-man advantage because of delay of game penalties to Corey Tropp and Keaton Thompson. Rempal opened the scoring 3:58 into the game. The Gulls tied the score 51 seconds later on Sam Carrick’s team-leading fourth goal of the season. Carrick has scored in each game of the season. The goals by Shaw and Fiore, both their firsts of the season, gave the Gulls a 3-1 lead. Ontario forward Brad Morrison scored an unassisted goal with 9:00 left in the first period. The Gulls were outshot, 43-36. Jared Coreau (1-1-0-0) made 38 saves for the Gulls, the Anaheim Ducks AHL affiliate. Cal Petersen (0-1-1-1) made 36 saves for the Reign, the Los Angeles Kings AHL affiliate. The Gulls scored on two of six power-play opportunities and killed four of Ontario’s five. The Gulls will begin a four-game homestand Friday against the Milwaukee Admirals, the Nashville Predators AHL affiliate, at the Valley View Casino Center.